The 41st Elite Corps and 327th Star Corps arrive on August 29, together with further additions and fixes. On August 29, two renowned divisions of clone troopers – the 41st Elite Corps and the 327th Star Corps* – are joining the action in Star Wars™ Battlefront™ II. Along with the trooper Appearances, the Hangar on Naboo is being added to the list of available maps for Blast and Custom Arcade. 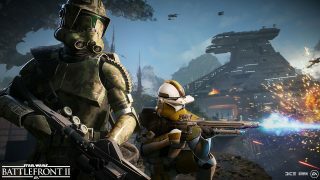 Plus, the fan-favorite Ewok Hunt** mode is made available permanently in Operations, and players will also be able to purchase Emotes and Victory Poses with Credits or Crystals. Get more in-depth about it all below, and for the complete breakdown of the Elite Corps Update, check out our latest Community Transmission. The 41st Elite Corps notably supported the Wookiee warriors on their forest-covered home turf during the Battle of Kashyyyk. Identified by their camouflage armor, the Elite Corps were led by Jedi Master Yoda when the Separatist droid army stormed Kachiro Beach. Also battling the Separatist movement across the galaxy during the Clone Wars, and joining the game with the Elite Corps Update, the 327th Star Corps are distinguished by their yellow armor markings. 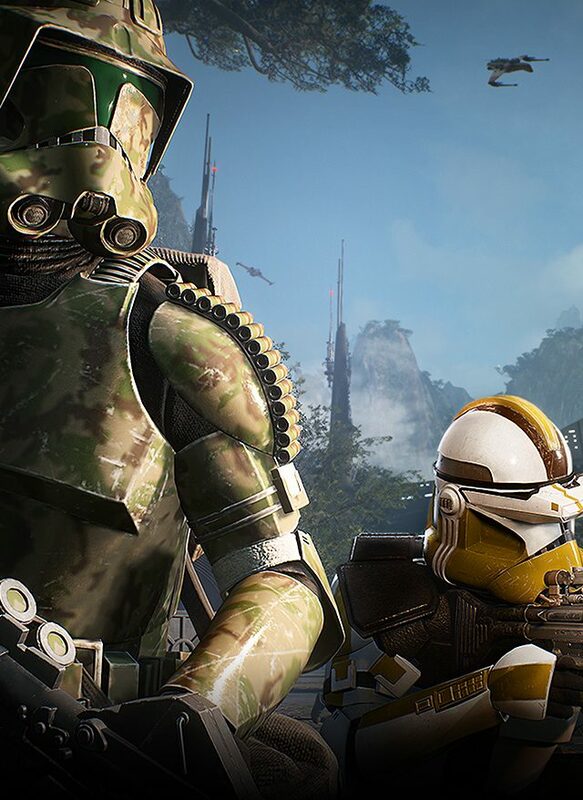 The new clone trooper Appearances – available for the Galactic Republic’s Assault, Heavy, and Specialist classes – are unlocked via the Collection tab in the Main Menu. There will also be bundles for the 41st Elite Corps and 327th Star Corps including the Appearances for all three classes. Purchase price will be released at time of availability. Rejoice, fans of fast-paced action both on- and offline, because the Palace Hangar on Naboo is making its debut in Blast and Custom Arcade! If you’ve played Heroes vs. Villains or Hero Showdown, you might already be familiar with this royal venue. If not, here’s a quick rundown for reference: this is where young Anakin Skywalker takes off with an N-1 Starfighter in The Phantom Menace. Also, the hangar is coupled with a vast generator room, which took inspiration from the iconic “Duel of the Fates” scene in the same film. Palace Hangar will be placed early in the map rotation, so players can join a game of Blast and quickly enjoy the Nabooian sights. Since its launch in April, Ewok Hunt has offered Ewok versus stormtrooper tension in the dense forests of Endor. 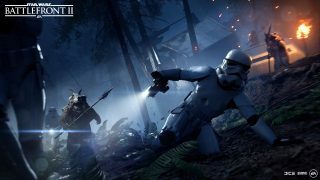 The mode – where the goal is to fend off Imperial soldiers with the primitive tools at your disposal playing as an Ewok; or, surviving until evac arrives if you’re on the stormtrooper side – quickly became a fan-favorite. Now, we’re happy to announce that the mode is being permanently added to Operations, along with Extraction and Blast. Looking to expand your repertoire of expressive Emotes, or to finally be able to strike that sought-after Victory Pose? Look no further – we’re releasing all Emotes and Victory Poses for purchase! All Emotes and Victory Poses are found under the Collection tab in the Main Menu, when highlighting specific heroes or troopers. Remember that these items don’t affect gameplay but instead are for anyone wanting to add a bit of personality to their units. We’re hoping that players will enjoy the Elite Corps Update and are looking forward to bringing much more in the months coming! Also, keep an eye on this space for full coverage and check out EA Star Wars on Twitter, Facebook, and Instagram or join the discussion on the official forums. **Requires Star Wars™ Battlefront™II on applicable platform (sold separately), all game updates, internet connection, EA account, and, for console players, Xbox Live Gold or PlayStation Plus membership (each sold separately).